With more than 2.4 million people incarcerated in the United States, the highest percentage of its citizens incarcerated of any country, it is important to remember that these individuals are not the only ones suffering as a result of their offense. Behind every person incarcerated are family members who are often bearing the hidden emotional, financial, and physical cost of incarceration. Many inmates’ loved ones are struggling to provide for the wellbeing and stability of their family on a daily basis. It is a struggle that goes largely unnoticed. These hardships are what these families and individuals want lawmakers and advocates to hear. In the briefing hosted by the Ella Baker Center for Human Rights and Forward Together, individuals with an incarcerated family member and those with experience as inmates shared personal accounts of the impact incarceration has had on their families. A particular emotional toll can be put on the children of incarcerated parents. Panelist Devin D. Coleman, a former prisoner and current author, poet, and public speaker discussed how his actions affected his young daughter. When he was released from prison he explained that his daughter didn’t want him to leave the house because she thought something bad was going to happen to him. He shared that if they were in the car and she saw flashing lights she would get scared and say things like, “Daddy are you okay? Daddy are you going to jail?” When discussing his family’s experience with incarceration Coleman stated, “My mistakes got pushed on to them.” He mentioned that his younger sister felt abandoned and hurt by his imprisonment and wrote him one letter during his time in prison accusing him of leaving her. The report Who Pays? 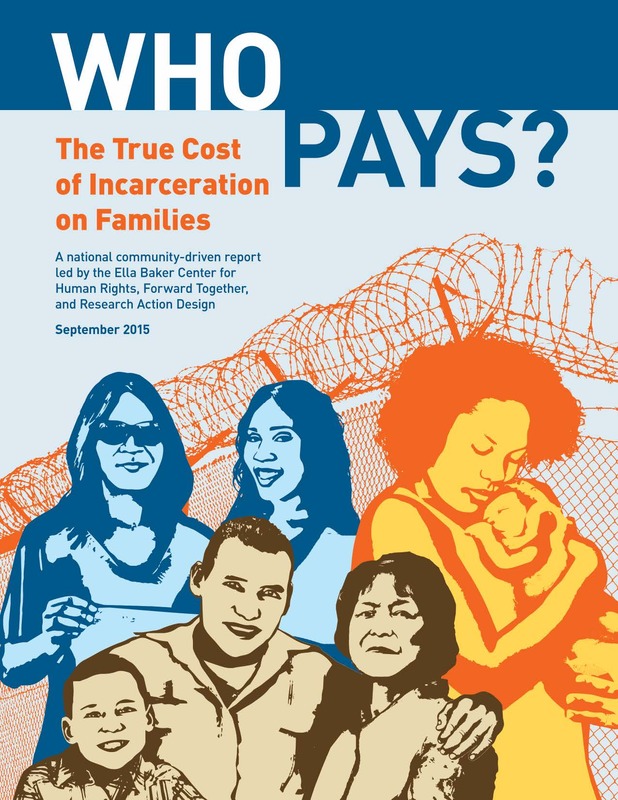 The True Cost of Incarceration on Families, lead by the Ella Baker Center for Human Rights and Forward Together,” exposes statistics of a disheartening reality for many of these families. Children are particularly affected by incarceration. A 2010 study found that 3 million children have at least one parent in prison. Additional research has also found that 60-80 percent of incarcerated women and an estimated 60 percent of men are parents. Parental incarceration creates a physical barrier, leaving children displaced. The risk of child homelessness rises dramatically when parent is imprisoned. Additionally, many children become part of the foster care system. When we separate families we are disrupting the framework that supports the entire family to lead healthy and successful lives. A wide body of research demonstrates that maintaining contact and visitation can serve as a protective factor against damaged child-parent relationships and sibling separation. However, challenges to visitation and communication serve to further weaken relationships between prisoners and their families. While regular phone contact has been shown to improve prisoner’s resilience, the high cost of phone calls makes this nearly impossible for most families. Before the Federal Communications Commission placed an interstate rate cap of $3.75, a fifteen-minute phone call cost $17. Even now, fees and high costs limit prisoner’s ability to communicate through the phone. The cost of visitation is also astronomical, making face-to-face contact a rarity for prisoners and their families. Some prisons charge background check fees for prisoners. Additionally, prisoners may be placed hundreds or even thousands of miles away from their families. The added costs of transportation, food, and related expenses often make it impossible for visitation to occur. Imagine the impact on a child who cannot visit with their father, or talk to their mother before bedtime. These restrictions destroy parental relationships, punishing children who haven’t committed a crime. The cost of incarceration is not just a criminal justice issue; it is a family issue. It is important to discuss how this reality impacts not only those incarcerated, but also their families and loved ones. Family members are often left out of the discussion but often bear a significant cost. In particular, children are often punished for the crimes of their parents. They may be forced into foster care or homelessness, and suffer from the depression that accompanies lack of contact with their parents. In order to solve this issue, we must address the prison-industrial system in American. Recently, Senator Bernie Sanders (I-VT) introduced the Justice is Not for Sale Act, cosponsored by Reps. Raúl Grijalva (D-AZ), Keith Ellison (D-MN), and Bobby L. Rush (D-IL), which would end private prisons and make state and local governments responsible for correctional facilitates. Private prison systems are profitable businesses that rely on return customers to fill the beds, thus encouraging the imprisonment of low-level offenders. By ending the incentive to imprison people, the Justice is Not for Sale Act would limit the amount of families impacted by incarceration and is a meaningful step towards a more rehabilitative and restorative justice system. Want to learn more? First Focus is a bipartisan advocacy organization dedicated to making children and families the priority in federal policy and budget decisions. Want to get involved? You can support our work by making a donation or joining our mailing list to receive updates and action alerts on this issue.